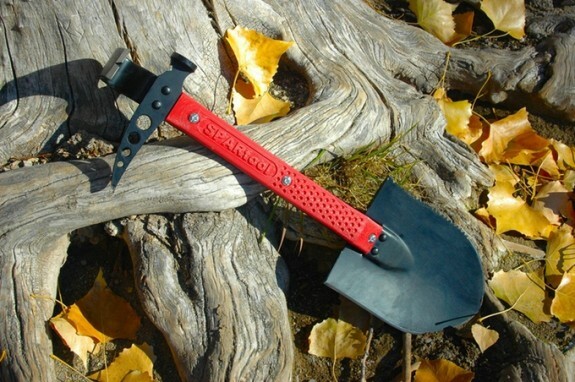 SPARtool is an “outdoor survival multitool” that is currently on Kickstarter in an attempt to crowdfund its production. There have been a number of these types of tools over the years but this one caught my eye because of its light(ish) weight and quality materials. Usually these sort of “survival” multitools are poorly designed and poorly made from junk steel. On top of all that, they are usually heavy. The SPARtool is made from 1075 carbon steel – a steel that actually stands a chance of holding an edge for chopping and sawing tasks and that will be easy to resharpen in the field with a file or stone like you would an axe. It is relatively compact already so there is no need to add collapsible mechanisms or detachable parts that can fail under hard use. The Zytel handle should be basically shock-proof while also keep weight and cost down. In many backpacking situations you are likely already carrying at least a shovel to deal with waste. You probably also carry some sort of cutting tool whether it is a hatchet, knife, or both. The SPARtool may be able to handle all of that for you with the addition of its other functionality though you may still want to carry a small knife. This tool certainly isn’t for the ultra-light crowd but if you don’t mind being at least a little bit geared up while you are the trail, it could be handy. This could also be a great addition to a car kit. If you live in a colder, somewhat remote locations like I do, you are likely already carrying a shovel and some basic survival tools in your car. Check out SPARtool on Kickstarter.